G. Marcellino, ‘Filologia, antiquaria e propaganda nel Quattrocento. Il caso del tempio di Apollo in Circo’, Commentaria Classica, 5, 2018, 61-79. 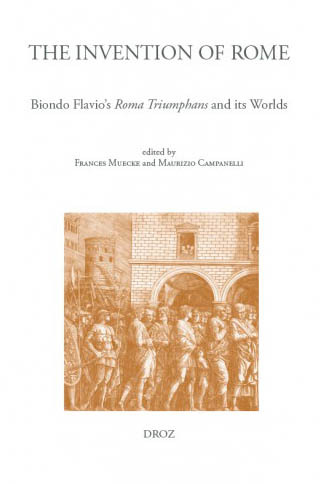 Giuseppe Marcellino, ‘Latin and the Vernacular in Biondo Flavio's Thought and Works: A Study with a New Critical Edition of the Correspondence with the Duke of Milan, Francesco Sforza’, in Neo-Latin and the Vernaculars, ed. by Florian Schaffenrath and Alexander Winkler, Leiden and Boston, 2018, 11–35. Duncan MacRae, ‘Diligentissumus investigator antiquitatis? Antiquarianism and Historical Evidence between Republican Rome and the Early Modern Republic of Letters’, in Omnium Annalium Monumenta: Historical Writing and Historical Evidence in Republican Rome, ed. by Kaj Sandberg and Christopher Smith, Leiden and Boston, 2018, 137-56. ‘Flavio Biondo’s Italia illustrata: Representations of spatial language and spatial thinking in text and maps’. A series of three panels on the European fortune of the Italian humanist Biondo Flavio (1392-1463), with a focus on the 15th and 16th century were presented at RSA Chicago 2017. ‘Italia illustrata’. The interaction of topographical descriptions and cartography in the works of Flavio Biondo and Leandro Alberti. Speakers included: Concetta Bianca, Maurizio Campanelli, Peter Fane-Saunders, Paul Gwynne, James Hankins, Giuseppe Marcellino, Ida Gilda Mastrorosa, Angelo Mazzocco, Frances Muecke, Agata Pincelli, Anne Raffarin, William Stenhouse. “Intorno alla piazza del Comune. La cultura forlivese fra XIV e XV secolo: da Boccaccio e Checco di Meletto Rossi a Biondo Flavio”. ‘Biondo Flavio and his European fortune’: A series of three panels on the European fortune of the Italian humanist Biondo Flavio (1392-1463), with a focus on the 15th and 16th century were presented at RSA Chicago 2017.